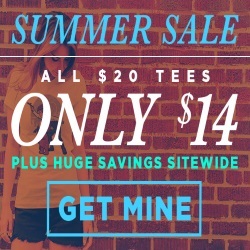 Sounds like a bad idea, right? Definitely not winning any beauty contests. Maybe. But hear me out. The basement is the only place I have to store the quantity of comics that I have and need to store away safely. I had used 6 long boxes and then a bunch of short boxes, and had probably one long box worth of comics just strewn about. Not some monster collection, but not a small amount, either. I needed to get these out of the spare bedroom and the only place I have left is my unfinished basement. Comics need to be kept dry, obviously. They also do better out of direct light. And they need to be protected from physical damage like bending or crushing. But I have to put them in the basement. Putting traditional cardboard long boxes in the basement could be trouble. This is because cardboard can get moldy depending on the humidity level of the basement. Basements are also prone to water issues such as flooding and burst pipes. In those cases the cardboard box will not offer much protection. These long boxes should not be kept on the ground, and they get heavy so a homemade shelf or storage system may need to get made to hold the long boxes. The kitty litter buckets can stack, so no dedicated structure is needed. They are waterproof, too, so you can stack them right on the floor. The lids on these Tidy Cat buckets close quite securely, too. I take a few extra steps to make sure my comics stay safe from the elements. When I get these empty of kitty litter I just tap the bottom and let the remaining litter hit the floor. The dust clinging to the inside of the bucket is fine, I think. The comics inside the bucket are bagged and boarded. The dust will not get on the comics because there is no air circulation in the bucket and the dust is minimal and just sticks to the inside of the bucket. I also toss a couple packets of silica gel to further limit moisture inside the bucket. I’m no scientist but it seems like that would help. OK, so that’s safety from light and from moisture. I also need to be sure that the comics aren’t going to get physically damaged. For this I think kitty litter buckets are better than long boxes, too. While a single kitty litter bucket won’t hold as many comics as a short box, the bucket will be sturdier. A physical problem with cardboard is crushing if you stack your comic boxes. Another is that while it holds more comics, when they lean forward or backwards it can crush or deform the comics if the box isn’t sorta full. The buckets hold less, so there’s less of that damage from leaning. And you won’t crush the buckets no matter how many you stack. Also, no shearing or twisting like stacked long boxes with mashed lids. How Many Buckets Do I Need? 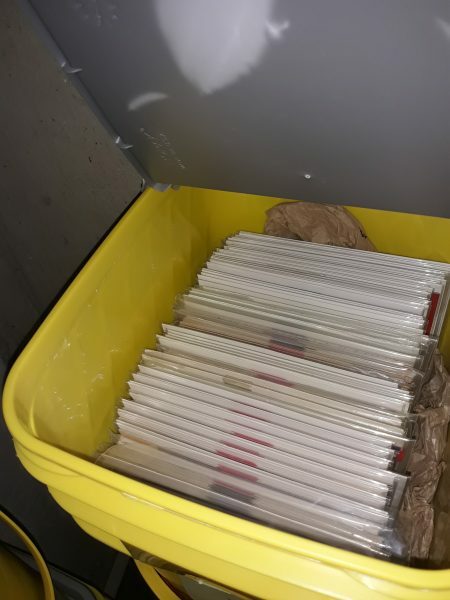 In one sample bucket I had about 60 comics, most of them individually bagged and boarded, stored upright and not cramped too much. In another I had about 45 and that one I just added some filler to keep it upright. So I would estimate something like 50-60 comics can fit into a bucket easily. 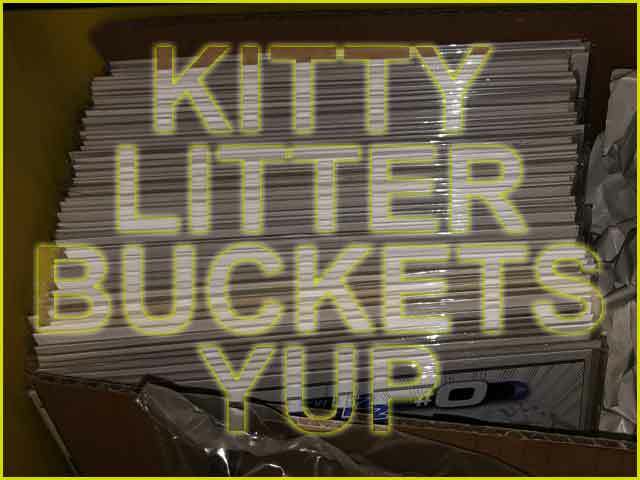 If you have 1,000 comics you will need about 20 kitty litter buckets. 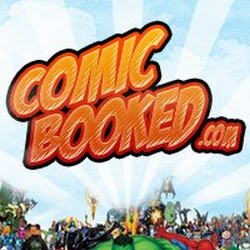 According to Bob’s Blog at ComicSpectrum you can put between 150-200 comics into a short box. So you need two or probably three kitty litter buckets to hold as many comics as one short box (150-200). 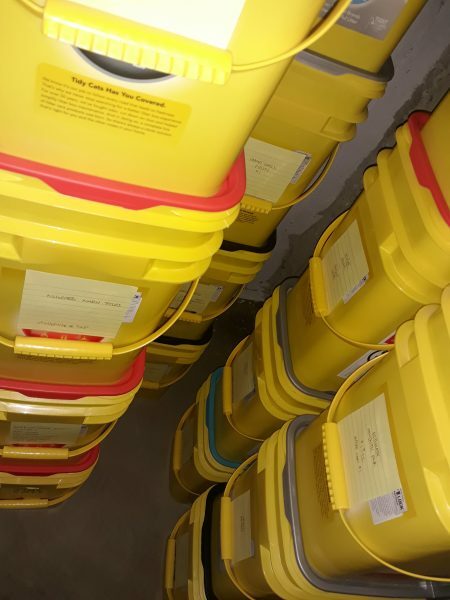 A long box can hold 250-300 comics, so that means you need 2-3 buckets to replace one short box, or you will need 5 or 6 buckets to replace a long box. Bucket width and depth actually ideal for comics. -1 or 2 pieces of flat rectangular cardboard pieces a little bit taller and wider than the comics. This cardboard will be the same approximate size as the pieces people put around comics in Gemini mailers. Put these cardboard pieces in front of and behind the comics in the bucket. 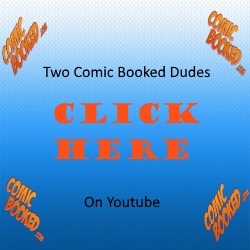 This is to prevent bending when the comics lean forward or backwards. 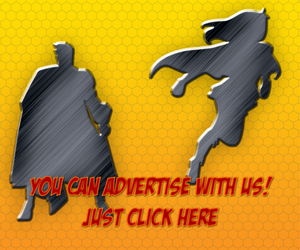 The bucket has rounded corners, and if the comics lean hard into the corners it would bend the comics. These cardboard pieces prevent that. -1 or 2 pieces of cardboard cut into the shape of the bottom of the bucket. Just put cardboard on the bottom below the bucket and trace it then cut with a box cutter just within the traced line. These cardboard pieces will make the otherwise uneven bottom inside of the bucket nice and flat and not damaging to your comics. -bubble wrap or other filler comes in handy. I put some filler on one side of the comics and usually in front of and behind the cardboard front and back. Just to keep things from getting weird, having things overlap wrong and cause spine roll. I use sticky notes and tape to label each bucket. I find I can generally just put related comics into buckets together and things aren’t hard to find. The filler and the cardboard for the pieces I acquire for free by just not throwing them away when I get packages. Not all cardboard is thick enough, don’t use crappy thin cardboard. The temperature in my basement is consistently cool. Probably about 55 degrees. I plan on putting a thermometer down there and checking to see how much it varies throughout the year. I may try to measure humidity in and outside of the buckets, too. Am I trying to say that kitty litter buckets are the best way to store comics? NO. But I do think they are the best solution for my basement, and maybe I made a compelling enough case for you to try the same way if you need to store your comics and the basement is really the only available space. If my idea has a flaw I’m not properly considering or if I’m just flat – out doing this wrong, please leave a comment on our Facebook page. I’m no expert, just a guy looking to keep his comics safe and keep my wife happy. You definitely can’t put as many comics into a bucket as you could even a short box, and that’s a significant shortcoming, but for me I think I will be good with this. Time will tell, and I’ll update if I remember.